The admission to this course is done on the basis of M.Ed. Admission Test conducted by the University in accordance with the orders of Govt. of U.P., Lucknow University statutes and regulations of NCTE. Interested candidates can apply online at the Lucknow University website, which is www.lkouniv.ac.in. Candidates must ensure that they fulfill the eligibility conditions before applying online. M.Ed. is a full time, professional, highly theoretical and research oriented course involving a variety of activities aimed at preparation of teacher educators. Two years M.Ed. 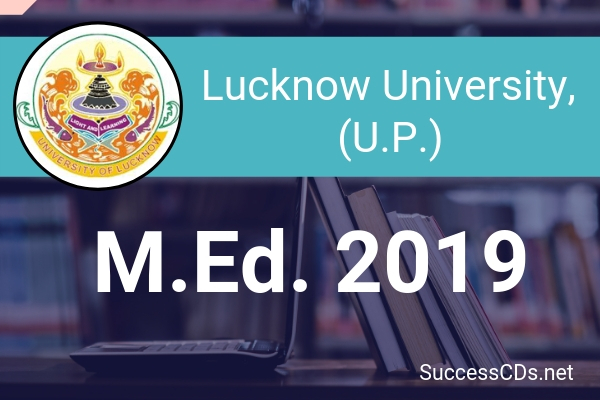 Course of University of Lucknow is conducted by its Faculty of Education. In addition to M.Ed., this Faculty runs a two years B.Ed. and two years M.A. (Education) Course. Faculty is equipped with modern facilities and infrastructure of research (for Ph.D. & D.Litt.) in Education. The teachers of the Faculty are known for conducting and supervising research on various aspects of Primary, Secondary, Higher and Teacher Education. The University Grants Commission (UGC) has included the Department of Education in its Special Assistance Program (SAP) for the thrust areas: 'Indian Philosophy' and 'Elementary Education'. M.Ed. Program is devoted to preparation of Teacher Educators. Lucknow University reserves the right to cancel any admission at any stage. Candidates who are appearing in the qualifying examination in the current year can apply for admission but they should fulfill all eligibility conditions on the day of admission. Test will comprise of 100 objective type questions, for this OMR sheet will be given. This section will comprise of 80 objective type questions, for this a separate OMR sheet will be given. This section will also comprise of 10 short answer questions. Step 4 Upload Photo and signature: Applicants have to upload their photo and scanned signature. Step 5: Preview: Applicants can preview all the entries made at this point. If there is some error they can edit these or start the entire process again. Once they have submitted the application fee the data submitted in the registration page cannot be edited under any circumstances.